Developing a strategic new website helped Gliffy to update its image, stand out among the competition and drive more targeted traffic. Gliffy was founded in 2005 as the world’s first net-native business graphics application. 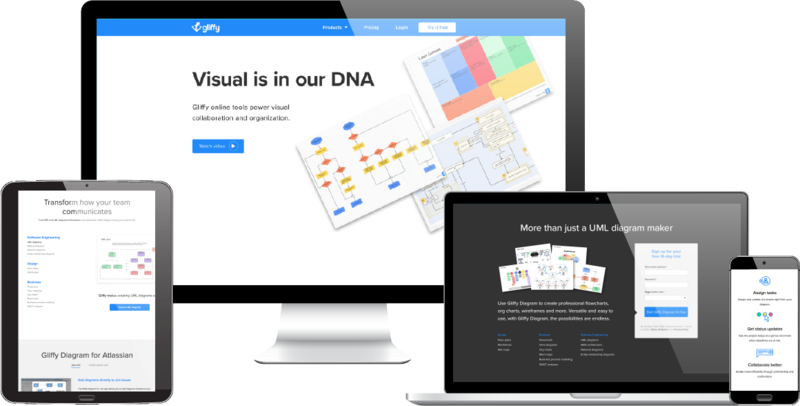 Its flagship software, Gliffy Diagram, boasts a simple drag-and-drop interface and ready-to-use templates that make it easy to create a variety of visuals online. Every good idea spawns imitators, and after Gliffy’s success, competitors emerged. Gliffy wanted a new website designed with an eye toward visual appeal, customer trust and SEO performance to bolster its position among the competition. Because visuals are central to what Gliffy does, we made the early decision to put the visual experience front and center – from the images used to the messaging crafted. To help with that, we opted for a clean design with lots of space and small pops of color. We wanted to show visitors what it’s like to use Gliffy, so we had Gliffy create GIFs and videos of its products. Now, when visitors go to the product pages, they immediately experience Gliffy Diagram and Gliffy Project firsthand. Early in our SEO research, we found a number of visitors coming to Gliffy via search terms for use cases, such as uml diagram. Though Gliffy ranked well for these educational keywords and was getting traffic from them, searchers were using them to learn, not to shop. The improvements in these “sticky” metrics reflect our ability to target and attract high-quality visitors with a deep interest in Gliffy’s products. The [Square 2] team was knowledgeable, responsive, on top of it and willing to work within our budget and timeline. It was a big project and involved a lot of coordination and work, but we were able to do it thanks to the hard work and cooperation of the team.